Relief crew lets another get away. Kyle McPherson to extended spring training. Not sure what that means. Justin Marks, left-handed relief pitcher assigned from the Charlotte Stone Crabs. Stats. How much more could go wrong? 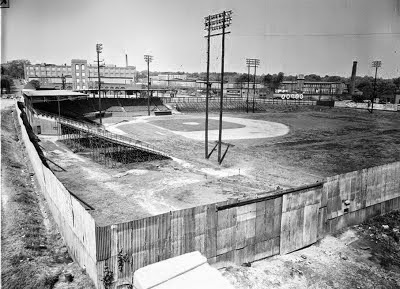 Rain delays game forever; pitcher Matt Andriese gets called for two balks; manager gets tossed; new guy doesn’t pitch very well, but isn’t helped by the three unearned runs; and the “closer” lets an inherited runner in and gives up a home run. The back-to-back home runs by Taylor Motter and Richie Shaffer in the 4th were fun, though. The Bulls new pitcher, and sole left-handed reliever, Justin Marks, made his first appearance. The Bulls are still just 22 games (193 innings) into the season. Nevertheless, the ERA trends are disturbing. 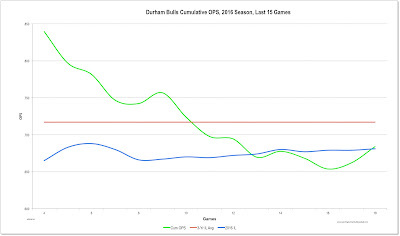 Added to that are the ugly defensive numbers: 15 unearned runs and worst-in-the-league 23 errors. Bulls slide below .500. Gwinnett moves back up into first place. The Louisville Bats come to town today. They are the Cincinnati Reds Triple-A team. 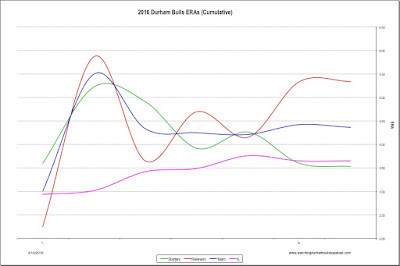 Even though they are currently 3rd in the IL West, they lead the Bulls in every category, especially hitting. 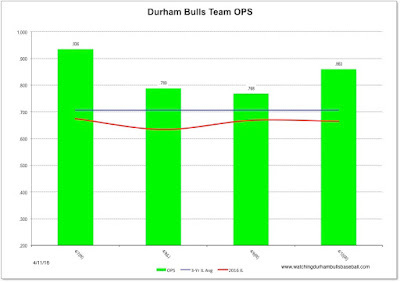 Note also that the Bulls have slipped to last place in the International League in batting average and their pitching is now in 12th. These are going to be challenging games. 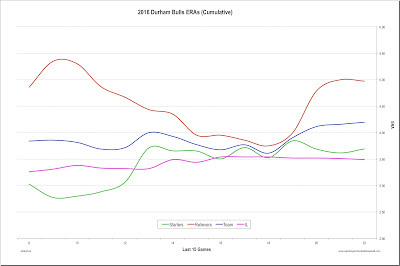 On Sunday we saw the best Bulls run differential of the year, +6. On Monday we saw the worst, -11. Austin Pruitt, who, until last night, had a stellar start to his season, in just 3.2 innings saw his ERA go from 1.89 to 3.57. His FIP grew from 2.40 to 3.60; his WHIP from a superb 0.68 to a still pretty good 1.10. What hurt the most was what happened after a brilliant catch and throw home by Dayron Varona in the 2nd inning, that made up for the two singles that opened the inning. Pruitt then walked the next three batters, pushing in a run. A Taylor Motter home run kept the Bulls in the game, but 3 Indian runs in the 3rd and 4 more in the 4th could not be overcome. 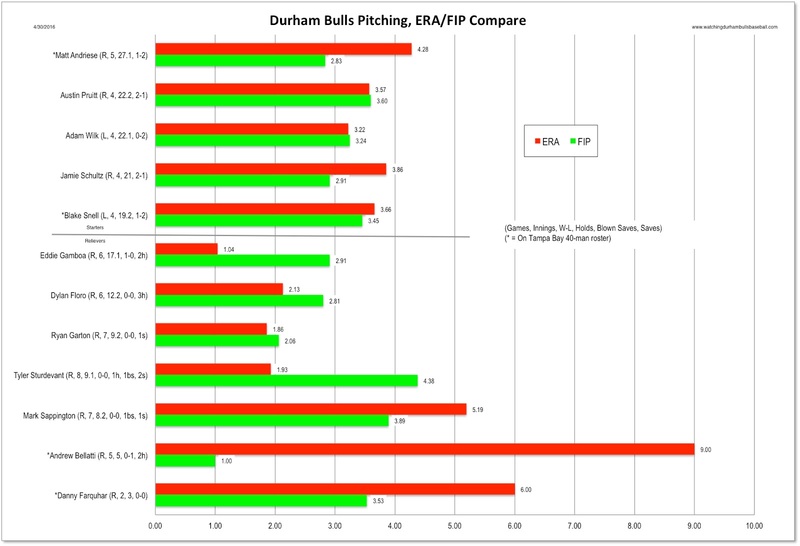 The Bulls' new pitcher came in for the 9th, right-handed (of course) Danny Farqhar. Not an auspicious beginning as he gave up 2 more runs. Farquar is a 29 year old who opened the season with the Rays after several years with the Mariners. This year he’s only had 5.1 innings in 6 appearances. He’s does have 185 innings of major league time so it's a puzzle that he has not made more appearances with the Rays. However, the Rays sent him down essentially in exchange for Jhan Marinez. With his time in service it’s surprising that he had options left. Stats. 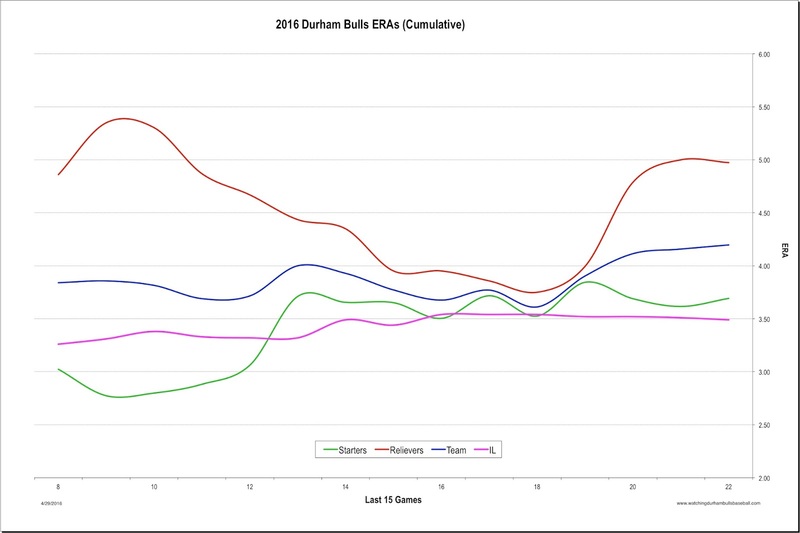 Cole Figueroa was one of my all-time favorite Bulls and it was mostly good to see him again. I’d rather he’d been able to stick with the Yankees or the Pirates, and I’d rather he did not get his first hits this year against the Bulls — a single, a double, and a triple with 3 RBIs. Maybe he’ll go back up to the Pirates before we play against him again. Now for something much more important than my usual geek stuff. You may never have noticed that the front row of the Terrace View seats don’t have cupholders — they don’t. That's a circumstance that has led to more than one spilled cup of beer over the years. 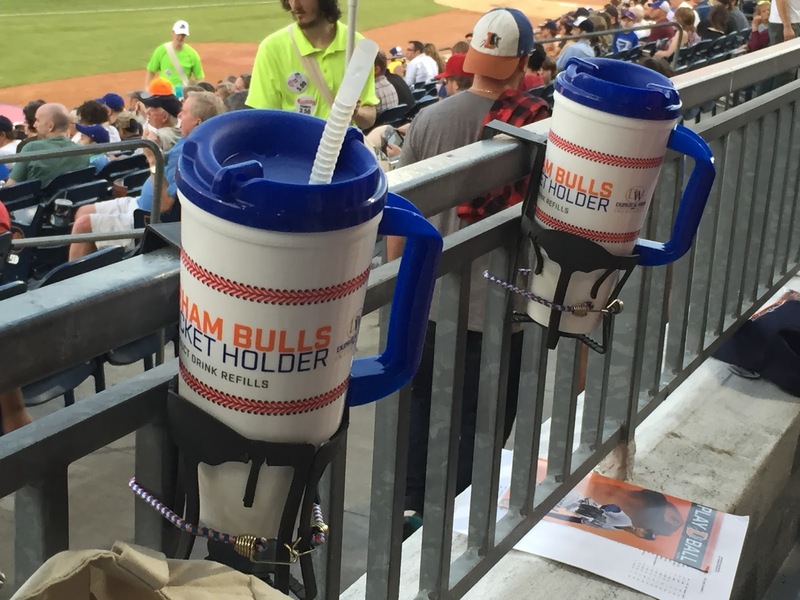 Mike Birling, the justly famous general manager of the Durham Bulls, promised that cupholders for those seats would be part of the multi-million dollar renovation a couple of years back, but they weren’t. In our annual conversations on the topic since then he has assured me (and others) that he’d take care of it. Several years on, after a visit to a local auto parts store, we’ve fixed the issue ourselves. Voila! Cupholders! On a very windy day, the game went into the 10th tied at 2-2. A Richie Shaffer double made all the difference and Jhan Marinez got his second win in relief. But then things got busy. Blake Snell got called up to pitch against the Yankees. This attracted a lot of attention in the webworld, including these notes from the Tampa Tribune, Rays Index, MLB Trade Rumors. Apparently he will be sent back to the Bulls after his start today. Young Chih-Wei Hu has been called up from Montgomery to fill Snell’s spot. He’s carrying an ERA of 0.00 in his first two starts with the Biscuits. He could be fun to watch if he gets a start in Durham. Stats. MLB Trade Rumors reported that Rays reliever Danny Farquhar was being sent down. Have not seen that anywhere else and not quite sure how that works out. Mikie Mahtook went on the disabled list for a pulled muscle, joining Luke Maile, who may, or may not, come off soon. To fill Mahtook’s spot Cameron Seitzer has returned from “extended spring training”. Seitzer played in game 1 this year, and several games last year. He was taken off the roster to make room for veteran Jake Goebbert. Goebbert is batting .050 in his 11 games (2 for 40 with 5BB) since being claimed from the Pirates. 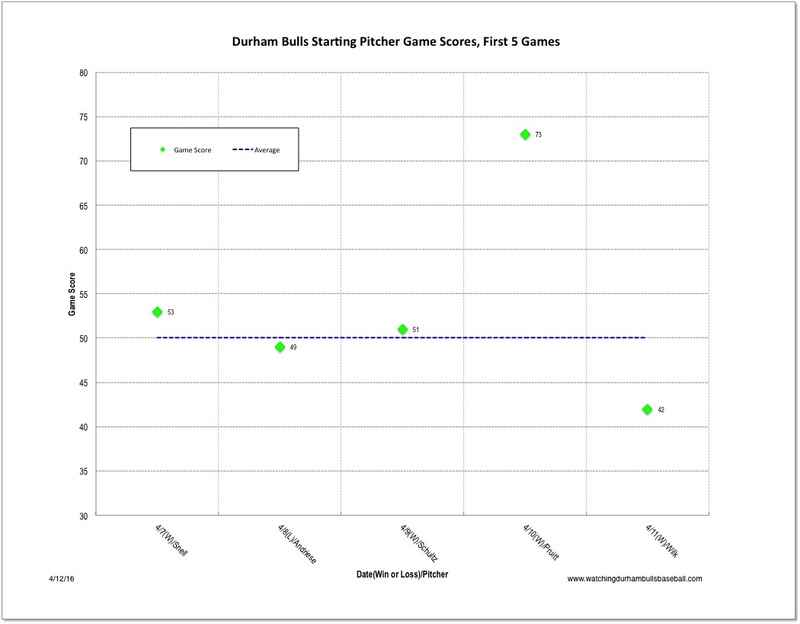 Seems like the Bulls would have been better off if Seitzer hadn’t been gathering rust these last 14 games. The DBAP got new infield grass (So now I get to worry about brown patches in right field). All because those Trinity College guys are messing things up. And then the ACC tournament is coming. But does look good from the stadium cam. N&O columnist Jake Shaffer reported that Peanut Guy, Da’Quan Samuel, got “fired” because season ticket holders were getting annoyed. Well, yeah, Samuel was a bit over-the-top, but so is Shaffer. “The peanuts will never taste as good.” Really? On the other hand, the column got a comments supporting Samuel. For myself, after two years, yeah, I got annoyed sometimes. 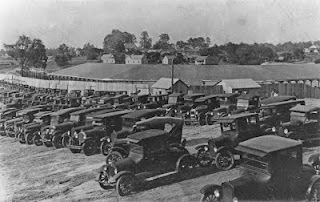 Particularly on days when the stands were almost empty. On the other hand, on an Education Day it was fun. 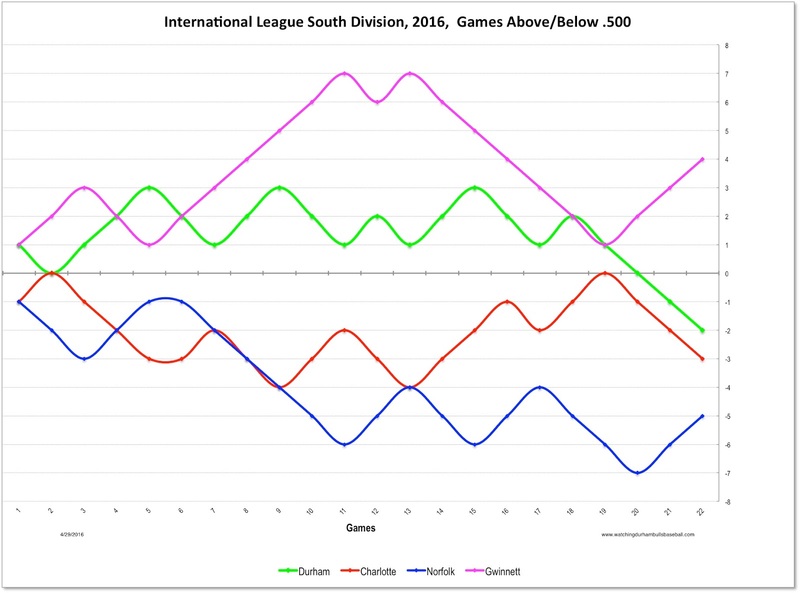 The Bulls finished off their first home stand of the season with some pitching/playing oddities, a noisy education day crowd of 8,700, and a 2nd place IL South record of 4-3. Matt Andriese never looked comfortable in his 5⅔ innings. Guess we could blame some of it on the umpires, who called two balks, but Andriese himself was responsible for the 2 wild pitches and an error. Some late inning excitement (and two runs scored), but the early dominance of Gwinnett’s Mike Foltynewicz could not be overcome. Mikie Mahtook has been outstanding in his leadoff role. He played in all 7 games with a terrific On Base Percentage of .455, 3 triples, 8 runs scored, and a stellar OPS of 1.075. Playing right and center, his fielding has been superb as well. Richie Shaffer started off ablaze and has since slightly cooled off, but his OBP of .484 is even better than Mahtook’s, partially due to the 6 BBs he’s drawn and his OPS over the 7 games is a superb .979. Dayron Varona was fun to watch in his 4 games. A canon of an arm, team-leading OPS of 1.078, and willingness to try anything, e.g., pitching the 10th inning on Tuesday. At the other end of our concerns are Jake Goebbert, 4 games, no hits, 3 BB; and Kyle Roller, 5 games, 1 hit, but 6 BB. We mentioned the long pants earlier. We haven’t mentioned that hitting coach Ozzie Timmons is usually not on the field coaching 1B, a break from tradition. Jake Goebbert and Kyle Roller are the ones that I’ve noticed. Haven’t sampled much of the food yet. Your comments/observations welcomed. 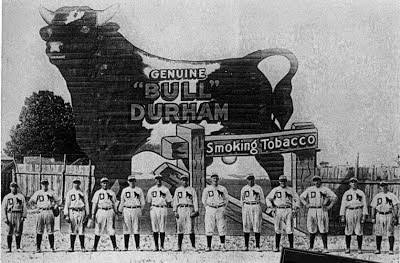 The Bulls are off for a very long, 10-game road trip to Charlotte (4 games), Gwinnett (3 games), and that odd run past Durham and over to Norfolk (3 games). They are back on April 24 to play their first out-of-division games with Indianapolis (Pirates) and Louisville (Reds). With the usual early season/small sample warnings, here’s how the collective ERAs are looking. Yes, it’s a small sample and just today's events moved the marker quite a bit; nevertheless, a 2-run gap between starters and relievers is worrisome. What in the world was outfielder Dayron Varona doing on the mound in the 10th inning? Especially after reliever Jhan Marinez had only thrown 14 pitches in the 9th? And at least two other relievers were available? Varona in nine years as a professional baseball player (7 in Cuba) had, according to Baseball-Reference.Com (stats), never pitched in a game. Result: Gwinnett scored a run and the Bulls did not recover in the bottom of the inning. I’m sure there’s an explanation. 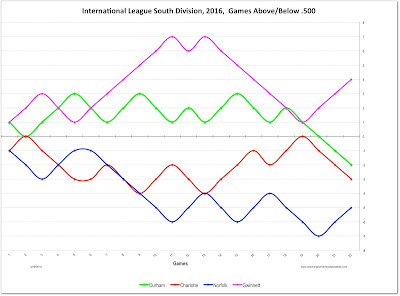 Something to do with orders from Tampa Bay, or the problems with today's 11:00 am game, or something like that. Wondering why either the Herald-Sun failed to ask or Manager Jared Sandberg failed to answer the question. The Braves got a gift from the Bulls. I’m guessing they didn’t even say thank you. In his first Triple A start Austin Pruitt was spectacular — the longest and best outing of any starting pitcher this year. Kyle McPherson, who followed him, not so much. In the top of the 4th RF Jaff Decker crashed into 2B Daniel Robertson not too long after hitting his home run in the bottom of the 3rd. Dayron Varona took his place and hit a double and a homer (3 RBI). 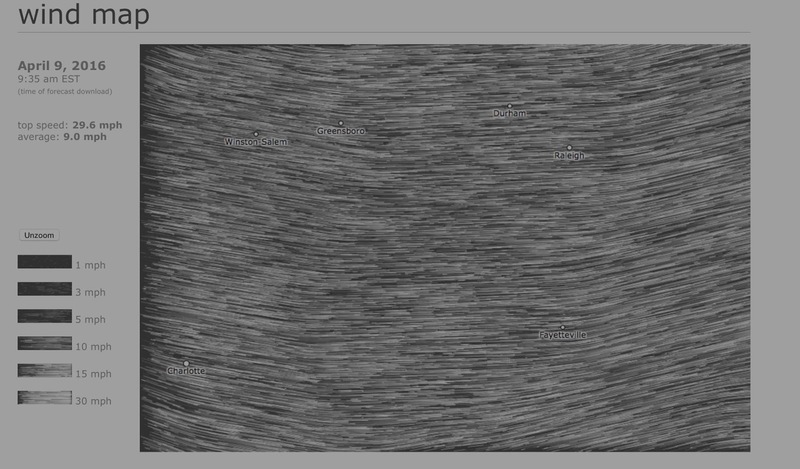 Now that’s depth in right field. 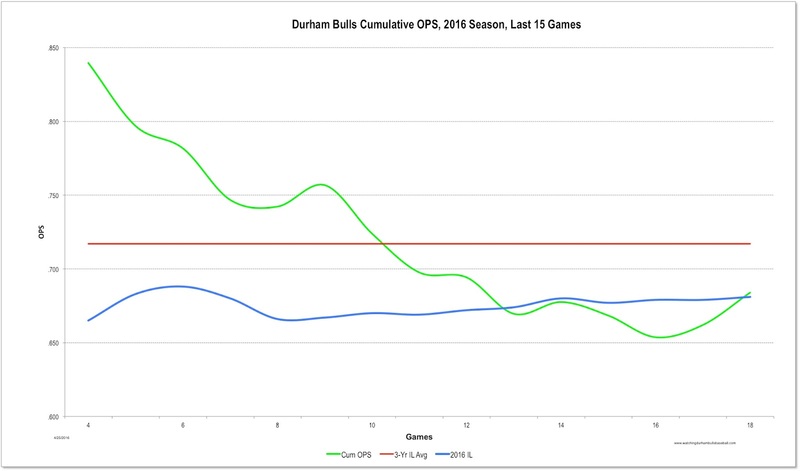 What’s really different about the Durham Bulls this year? Trousers. 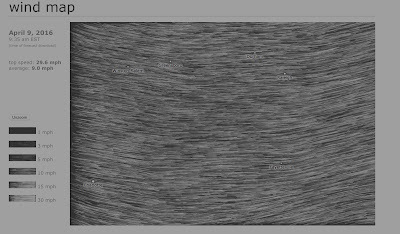 OK, it took me a while to notice, but I’m guessing youth (as in managerial youth) finally won out. Yesterday most of the Bulls were in long pants. In all previous years the only players in long pants were re-habbing major leaguers. Pitcher Austin Pruitt and 1B Richie Shaffer were holdouts in knee breeches. For his AAA debut Pruitt had a career high number of strikeouts, a solid 6 inning start, and a win. He spent last year in Montgomery, pitching 160 innings and recording 122 K’s. He looks to be a very solid asset. Stats. McPherson was simply awful in his short outing. He has been playing pro ball for parts of 9 seasons, although the last time he put in a lot of innings was in 2011 in the Pittsburgh system. He’s coming back from surgery and spent 2015 in the Rays system. The Rays are good at spotting pitching talent, so we hope that this game is an anomaly. Stats. Set your recorders for PBS’s documentary on Jackie Robinson. Starts tonight on WUNC. Consider Saturday night’s win a gift from the Charlotte Knight’s battery of catcher Hector Sanchez and reliever Phillipe Aumont. Hats off to broadcaster Patrick Kinas who called out the shaky teamwork of the two from the beginning of the 8th inning. A single by Richie Shaffer was followed by two wild pitches that got him to 3B (and a walk that got Kyle Roller on base). A double by Daniel Robertson tied the game. Another wild pitch scored pinch-runner Nick Franklin, and that was enough to win the game. Goebbert is a left-hand hitting first baseman who was very recently claimed from the Pirates system. He played all last year at AAA El Paso (Padres) and carried a very nice .844 OPS. He could end up be a real asset to the Bulls. Stats. Varona has had his 15 minutes of fame this year when he accompanied the Tampa Bay Rays to Cuba to play the Cuban National Team. He was the only Cuban on the Rays and got a bit of returning hero treatment. He had a decent 2015 at A and AA last year and 40 games in the Puerto Rican Winter League. Stats. Well-traveled, 32 year-old Corporan played in the Rangers system last year, but went to spring training with the Yankees. The Rays got him from there. He adds some depth and experience to a roster that’s unusually young (average age of hitters is 25.4). Stats. Schultz made his AAA debut and, with the notable exception of the two solo home runs, did just fine. He spent all of last year in Montgomery, starting 27 games and pitching 135 innings with 168 K’s. Think he’s going to be fun to watch. Stats. 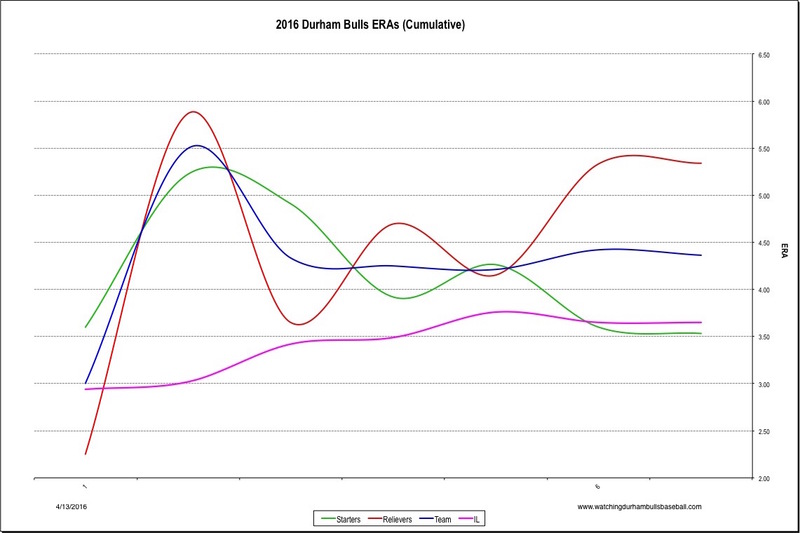 For the last three years knuckleballer Gamboa bedeviled Durham Bulls hitters as a reliever for the Norfolk Tides. Very happy to see him wearing a Bulls uniform. He’s going to be fun to watch. Stats. Interesting conversation with Neil Solondz about his knuckleball and joining the Rays here. RHP Mark Sappington: 1 inning, 0 hits, 0 runs, 1 BB, 2 K’s. Sappington came to the Rays out of the Angels system and spent last year in Montgomery. This was his AAA debut. He had a good year last year and has some interesting comments in his Solondz interview. Stats. 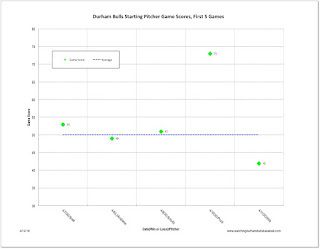 The Bulls had a nice lead going into the 6th, but Andriese ran into a bit of trouble and new-to-the-Bulls reliever Tyler Sturdevant let two runs score and gave up one of his own. The Bulls came back to tie it up, however 2015 stalwart Jhan Martinez couldn’t hang on. Roller spent the last two seasons with the AAA team of the Yankees, the Scranton/Wilkes-Barre Railriders. Exclusively a DH and first baseman he was signed as a minor league free agent. Solid stats. Looks like a good addition to the roster. Stats. RHP Matt Andriese*: 5 ⅓ innings. 6 hitds, 4 ER, 0 BB, 9 K’s. Matt Andriese is essentially with the Bulls for a month or so while the Tampa Bay Rays work with a 4 (instead of 5) man pitching rotation. He had a fine year last year in his 65 innings with the Bulls and his 65 innings with the Rays. Stats. Solondz interview. RHP Tyler Sturdevant: ⅓ inning. 1 hit, 1 ER, 3 BB, 2 inherited runners scored. Sturdevant spent 2015 with the Cleveland affiliate, the Columbus Clippers. Decent stats. Garton is working his way up through the Rays system. He had 70 K’s in 61 innings last year with Montgomery. Stats. Solondz interview. RHP Jhan Martinez: 1⅔ innings. 2 hits, 2 ER, 1 BB, 2 K’s. Martinez was a star of the 2015 Bulls bullpen. Have to think he will come around. Stats. Solondz interview. Rosterification begins. Cameron Seitzer who started at 1B on Thursday is off the roster and Jake Goebbert has been assigned. Gooebert was claimed off waivers from the Pirates. We’ll profile him when/if he ever shows up at bat. Baseball America had some love for Blake Snell's game Thursday (Thanks to DRaysBay for the link). Tampa Bay has released a top prospects list. Several Bulls are on it. Today’s the day. The Bulls are back! The team’s roster is here and there’s quite a few of players we’ve seen before. Most notable among the hitters are Mikie Mahtook, Richie Shaffer, Taylor Motter, Nick Franklin, and Luke Maile. Pitchers include Matt Andriese, Andrew Bellatti, Dylan Floro, Jhan Marinez, and Blake Snell. Several new guys up from AA. It’s a good looking team. A few changes have been made at the park. Most visible is the new netting that stretches from first base to third base. I’m not sure I like it, since it will be in front of my seat. I also think folks should be paying attention to the game and not lallygagging. On the other hand, players seem to like it and I certainly have to respect their views. And then there’s the food and other stuff as discussed in this TV spot this morning. Today’s game starts at 6:05. That means we’re going to be on the Durham Freeway during rush hour. 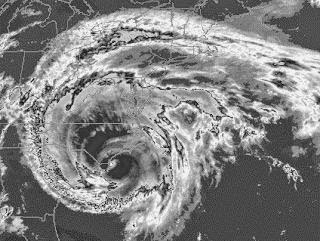 Grumble, grumble, grumble. Weather forecast looks OK, especially for April.